Redbox gives an easier and cheaper way to watch DVD movies - rent DVD from Redbox. With $1 only, Redbox not only get everything convenient and fast, but also allowing users to enjoy the new releases DVDs. However, you can only watch these DVDs for a short period of time. If you wanna watch them thereafter, another payment is required again. Why not rip Redbox DVD for a permanent storage? In this article, we focus on the way how to rip Redbox DVD for repeatedlly playback on Mac/PCs, iPhone iPad Android devices on the go later. Best Program to Rip Redbox DVDs to Mac/PC, Hard Drive etc. It's a bit trickier when dealing with Redbox movies backup. To copy Redbox DVD, you need a Redbox DVD ripping tool. MacX DVD Ripper Free is exact the solution for you. With it, you can esaily bypass the Redbox DVD copy protections, no matter the recent released DVDs, 99-title DVDs, TV series DVDs, workout DVDs, and other damaged or unplayable DVDs. This free DVD ripper for Mac rips both homemade and commercial DVDs to MOV, MP4, MKV, M4V, iTunes, Apple TV video, and copy DVD to Macbook, Windows PCs, NAS, superdrive with original quality. Directly rip DVD to iPhone 8/7/6S/SE, iPad, Galaxy S8, Huawei, HTC etc. A few mins for a full-length DVD movies, thanks to HT tech and multi-core utility. Free edit (crop, trim, add subtitles, etc.) and adjust ripped DVD parameters. 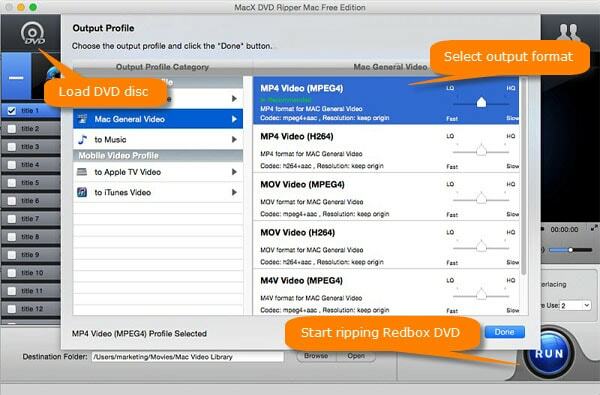 Insert your Redbox DVD rental to the DVD-ROM of your Mac or Windows computer and launch the downloaded DVD ripper. Then click on "Add Disc" to import your Redbox movie. As the DVD imported, you find the right DVD title is automatically selected and there pops up a output format window, which you can easily convert DVD to Quicktime MOV, H.264, MP4, MPEG or directly rip DVD to iTunes, Apple TV, iMovie etc. as you like. Specify an output folder on your computer (computer hard disk, external hard drive or portable devices) to save the output files. Click "Browse" button to choose the path where you want to save the output files in. Step 4: Start Redbox DVD ripping process. After the above steps done, click "RUN" to start to rip Redbox DVD free. You can pause or stop the ripping process after it started. Usually, only a few minutes are needed for a full-length DVD movie. Is It Legal to Digitize Redbox DVD? As for ripping Redbox DVD movies, it's actually a grey zone, depending on the law of your country. We hold the opinion that if you rip Redbox DVD for personal use, it doesn't matter. While if you wanna share your ripped Redbox DVD movies to web sites, or to your friends and family, we don't encourage your to do so. All in all, we only advocates using this free DVD ripper to copy and transcode DVDs under the concept of Fair Use and does not encourage any illegal reproduction or distribution of copyrighted content. Please abide by the local DVD copyright law before doing it.